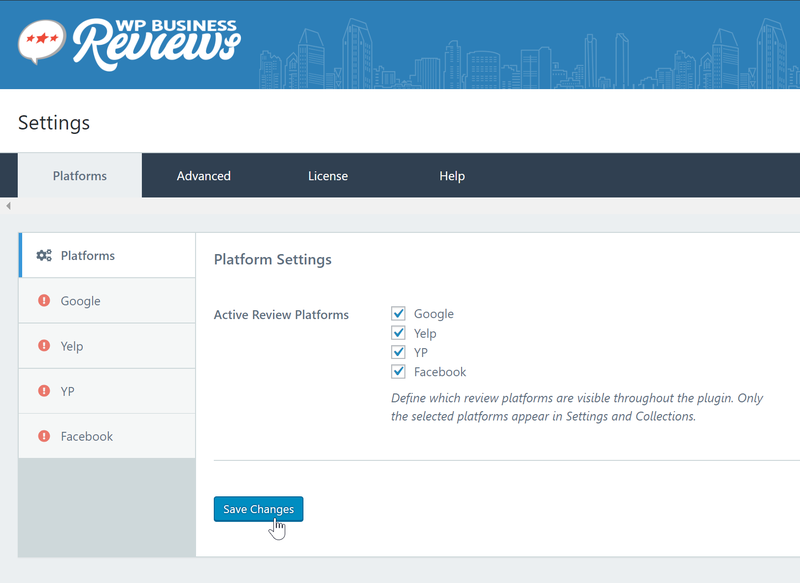 The WP Business Reviews Platforms settings panel showing all the Platforms enabled but not connected. In order to receive updates to your WP Business Reviews plugin, you need to enter your license key. To obtain your license key, log into your WP Business Reviews account page and click the “licenses” icon. Copy the license key you find there. Next, log into your WordPress website, and navigate to Reviews>Settings. Select the “License” tab, paste your key in the box and activate your license. On your WordPress dashboard navigate to ” Reviews > Settings.” Select the “Platforms” tab and choose which review platforms you would like to have available to connect to. Advanced settings dictate how your site stores data if you ever need to uninstall WP Business Reviews. Unless you plan to cease using and displaying reviews we suggest that you leave the default “Keep all plugin settings, collections, and reviews” selected. The Help tab will display helpful videos for using WP Business Reviews and links to our documentation, support, and your account page.